West Windsor, N.J. – Mercer County Community College’s (MCCC’s) Kelsey Theatre has announced its upcoming season and it’s a blockbuster by any measure – packed with Broadway hits, family favorites, special holiday performances, and shows for the younger set. Says M. Kitty Getlik, Kelsey’s Artistic Director, “As the college celebrates its 50th anniversary, we have created a lineup worthy of that milestone.” She notes the major Broadway shows on this year’s schedule including “Miss Saigon,” Lin Manuel-Miranda’s “In the Heights,” “Billy Elliot, The Musical,” and Disney’s "A Little Mermaid.” Rounding out the schedule are comedies, dance and the Kelsey Kids Series, offering six shows for the younger set. PlayFest 2017, the college’s – and the state’s – very first new play festival for current and former community college students takes place in March. The full-length schedule gets off to a flying start with “Miss Saigon” for three weekends, Sept. 9 to 25. PinnWorth Productions presents this moving musical testament to love and the human spirit, set against the harsh backdrop of war and its aftermath. Kelsey Theatre staff members are preparing for a banner season of Broadway musicals, dramas and family shows. 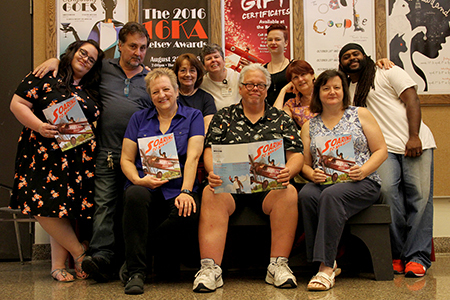 Seated, from left, are Kelsey Theatre Artistic Director M. Kitty Getlik, Sean McGrath and Diana Maurer; back row, from left, Lyndsey Goehrig, Dan Spalluto, Jane Coult, Amy Bessellieu, Casandra Kniskern, Kathryn Pinner and Thomas Lott Pittman. On a decidedly lighter note is Neil Simon’s “Jakes Women,” about a novelist who is more successful with fiction than with life. The show is presented by Maurer Productions OnStage Sept. 30 to Oct. 9. The Tony Award-winning Best Musical “In the Heights” is presented by The Pennington Players Oct. 14 to 23. From “Hamilton” creator Lin-Manuel Miranda comes the vibrant glimpse of life in New York City’s Washington Heights neighborhood, filled with memorable characters and magical music. The mood shifts to another Neil Simon comedy – with a twist – The Yardley Players present “The Odd Couple – Female Version” Oct. 28 to Nov. 6. In this go-round, it’s compulsively tidy Florence Unger and incurably messy Olive Madison who are trying to share an apartment – with neighbors who are about to make matters even worse. From Nov. 11 to 13, Theater To Go presents “Roebling - The Story of the Brooklyn Bridge,” a drama by New Jersey playwright Mark Violi about John Roebling’s most famous bridge project, one that spanned 14 years, included 600 workers, and resulted in at least a dozen deaths, including Roebling’s own, leaving it to his daughter-in-law, Emily, to get the job finished and the Roebling legacy secured. As Kelsey Theatre heads into the holiday season, M & M Stage Productions brings "Babes in Toyland” to life Nov. 18 to 27. Fairytale characters take their fate into their own hands as they battle the wicked Barnaby. After “Babes,” Forté Dramatic Productions returns with a new “Very Kelsey Christmas,” a variety show mix of music, comedy, skits and audience participation, Dec. 10 and 11. Patrons can ring in the new year with a blockbuster event. “Billy Elliot, The Musical” will be presented by Pierrot Productions for three weekends, Dec. 30 to Jan. 15, including New Year’s Eve and New Year’s Day. Featuring a score by music legend Elton John, this inspiring tale chronicles a young boy's journey from boxing to ballet, battling the odds to make his dream come true. Kelsey Theatre moves into 2017 with lots of laughs. The Pennington Players present “Unnecessary Farce” Jan. 20 to 29, a madcap comedy featuring two cops, three crooks, eight doors – and one killer in a kilt. PinnWorth Productions serves up its own kind of mayhem with “God of Carnage” Feb. 3 to 12, as two couples convene to iron out difficulties between their sons. The laughs continue with “Boeing, Boeing,” presented by M & M Stage Productions Feb. 17 to 26. This Tony Award-winning comedy stars Bernard, an airline pilot who is juggling three gorgeous flight attendant fiancées, until a newer, faster model of plane changes his flight schedule and his life! In a first for MCCC and the state, Mercer presents “PlayFest 2017,” a new play festival for current and former community college students, from March 7 to 12. PlayFest will showcase the diverse and talented voices that spring from the state’s network of community colleges. Tickets for festival performances go on sale in January, with subscribers receiving a special discount. More information for playwrights is available here. Next up is Theater to Go’s presentation of “To Kill a Mockingbird” March 17 to 26. With themes of racial injustice, courage and compassion, this riveting drama based on the Pulitzer Prize-winning novel by Harper Lee is the story of tomboy Scout Finch and her lawyer father’s most controversial case. Kelsey returns to the lights and sounds of Broadway as Playful Theatre Productions presents “Wonderland” March 31 to April 9. Audiences will delight in this musical adaptation of Lewis Carroll’s Alice’s Adventures in Wonderland and Through the Looking Glass featuring a catchy score by Broadway composer Frank Wildhorn. The MCCC Theatre/Dance program, with technical assistance by Entertainment Technology students, journeys into the world of the surreal with “Blood Wedding” April 21 to 30. Federico Garcia Lorca’s masterpiece about surging passions and rebellion is infused with classic Spanish dance forms, including Flamenco, Tango and the Paso Doble in a mesmerizing performance. Pierrot Productions brings yet another Broadway hit to the Kelsey stage May 12 to 21. “The Boy From Oz” tells the story of Peter Allen, an Australian boy who grows up to be an Oscar-winning song writer and Radio City Music Hall concert star with famous songs including “Don't Cry Out Loud,” “Love Don't Need a Reason,” and “I Go to Rio.” The music continues with a family favorite when The Yardley Players present “Disney’s The Little Mermaid” May 26 to June 4. This beautiful love story based on the Hans Christian Andersen tale stars Ariel, Prince Eric, Flounder the Fish, Scuttle the Seagull, Sebastian the Crab and, of course, the Evil Sea Witch, Ursula. The irresistible musical score includes such favorites as "Under the Sea," "Kiss the Girl," and "Part of Your World." Two classic plays complete the roster of full-length shows. Maurer Productions OnStage presents “The Glass Menagerie” June 10 to 18. The fragile bonds between a frustrated mother, a daughter lost in her imagination, and a son intent on rebellion are torn apart with the arrival of a gentleman caller who raises hopes that can never be realized. Shakespeare ’70 closes out the season with “Measure for Measure” June 23 to July 2. Whorehouses, nunneries, betrothals and beheadings are all part of Shakespeare’s Vienna as he explores the arrogance of power in a play that hovers between comedy and tragedy. The Kelsey Kids Series offers shows that introduce children to the joy of live theater in one-hour productions. “Beloved Prey,” a children’s opera by MCCC alumnus Kento Iwasaki, is presented by The Traveling Opera Company Sept. 24. Featuring colorful costumes and masks, this story of an unusual friendship between an antelope and a lioness blends traditional Japanese Noh theater and instrumentation and stylized dance movement. The classic fairytale “The Princess and the Pea” is hilariously retold in Virginia Rep On Tour’s musical version Oct. 1. And then it’s time to go festive with two holiday shows. The Kelsey Players present “Twas The Night Before Christmas” Dec. 2 to 4, an annual production that captures the excitement and wonder of the long-awaited midnight visit by Santa Claus, made famous in Clement Moore’s beloved poem. An abridged, fully narrated version of “The Nutcracker” follows Dec. 16 to 18, performed by The New Jersey Youth Ballet. On April 22, young audiences take a trip to “The House at Pooh Corner” with Piglet, Tigger,andof course, Winnie-the-Pooh.Virginia Rep On Tour presents this charming production, faithfully based on the A. A. Milne classic. ArtsPower completes the children’s season with “Biscuit” onMay 20. This new musical features a frolicking puppy who loves exploring, stirring up mischief – and being part of a family. Ticket prices for full-length musicals are $20 for adults, $18 for seniors, and $16 for students/ children; non-musicals are $18 for adults, $16 for seniors, and $14 for students/children. Ticket prices for the Kelsey Kids Series are $10 for children and seniors, and $12 for adults. Tickets for special events are $20 for all and include “Miss Saigon,” “In The Heights,”“Billy Elliot, and "The Little Mermaid.” Reock & Roll Revue’s concert is $25 for all. Current subscribers may renew now through August 10 for preferred seating. Discounted subscriber packages include premium seating, exchanges for performances of the same show, special "add-a-show" rates, advance sales of single tickets, and as much as 45 percent off regular ticket prices. Tickets for all individual shows are also on sale now through the Kelsey Theatre Box Office in person or by calling 609-570-3333. Box office hours are Monday through Friday, 9 a.m. to noon; and one hour before show time. Group discounts are also available. Tickets may be purchased online starting Aug. 20 at www.kelseytheatre.net. Patrons may also purchase tickets by mail with checks payable to MCCC/Kelsey Theatre, P.O. Box 17202, Trenton NJ 08690. Gift certificates are available in any amount. To request a print copy of the 2016-17 season brochure, email kelsey@mccc.edu or call the Box Office. To view the brochure online, click here.